Parents interested in accessing a good music education for their children are invited to come along to the Centre for Youth Music Open Day being held at Charles Darwin University Casuarina campus this Saturday, 6 September from 9.00am to 1.15pm in building Orange 6. The Open Day will be a great opportunity for children and their parents, who have talked about music lessons to come along, see what’s on offer and put the talk into action. 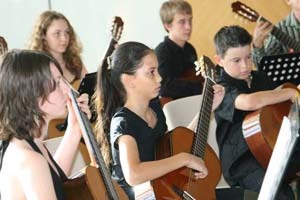 The Centre for Youth Music is located within the School of Music at CDU and offers individual and ensemble music instruction for children aged from as young as three up to youth aged to 18. From 9.15-9.50am there will be a free ‘have a go’ session for junior music students where three and four year olds and their parents can join in on a range of activities. No booking is required, just come along, and perhaps win the lucky door prize of free tuition in the program for next term. A free group keyboard class will be run from 10.00am-10.50am for children aged five-eight, but with places limited bookings are essential. Call Glenda on 8946 6860 to register.